Bertucci’s is your portal to Italy without leaving home. Our house dough, exclusive tomatoes, and roasted vegetables are all made or procured fresh daily. Whether you order our brick oven pizza, authentic Italian pasta dish, or just a little bit of dessert, we know you will experience a delicious meal every time you visit our corner of Hingham, conveniently situated near the Derby St Shoppes and minutes from the Patriot Cinemas and Hanover Mall. 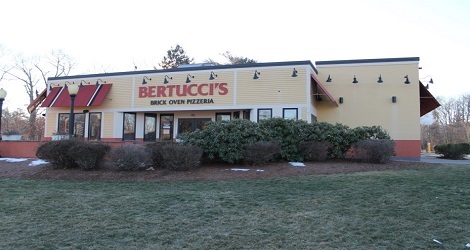 The Bertucci’s team is dedicated to bringing you real Italian food in the heart of Hingham. Our team prepares every dish fresh, using recipes from Italy’s kitchens. Whether you’re in the mood to try a brick oven pizza with your favorite toppings, a calzone crafted by hand just for you, or a pasta dish seasoned to perfection, Bertucci’s is the place for you. In addition to our comfortable sit-down restaurant, we offer both carryout and catering options if you need us to come to you. We know how busy life can get, so these choices allow you and your family to enjoy Bertucci’s whenever and wherever you desire. Whether you have a busy night and need to pick up food to take home or you’re hosting an event and need us to bring meals to you, we’ve got you covered. If you’re interested in taking advantage of carryout or catering, contact the Hingham team today to discuss your order. We take pride in offering a high level of service that will keep you coming back year after year.